Collectors, why do we do it? We put ourselves through the stress of late night nail biting auctions, we scour markets, car boots, game stores, classifieds, everywhere we can think of, just to try and get our next fix. Collecting can be something that brings people together and creates communities and exciting conversation. This isn’t always the case, but it’s how I’d prefer to think of most of them. I have always collected one thing or another, for as long as I can remember I’ve had collections. I think the first thing I recall collecting (stay with me here, please) was dead bugs! I don’t know why but for some reason I had this odd fascination with creepy crawlies and would keep them in boxes under my bed. My grandma would keep any she found around the house in little match boxes for me whenever I went round. I don’t know why I collected these, but I did (Just to clarify with this, there was no wing pulling a la Ashford style going on!). After my odd fixation with bugs I moved on to more normal things. I collected comics, trading cards, football stickers, CD’s and so on. I enjoyed lending and swapping these with friends and seeing what they had in their collections, it was fun. Over time I would lose interest in some of my collections and gradually they would disappear. I would give them away, chuck them out, lose them, sell them, trade them for something different. I guess it was just part of growing up and outgrowing certain interests. Some of these collections would last longer than others and a few of them are still ongoing; though instead of swapping them in the playground at school, I’m bidding for additional items online now. Now the thing with collections is you generally know what it is you’re letting yourself in for when you start them. I started collecting trading cards; I knew how many were in the set that I would need. I started collecting football stickers; I had a book with spaces for every sticker I needed. With these sorts of things you know what is in a set, you know how many you need and you can get an idea of the investment of time, effort, money and emotion you’re going to be sinking into this collection. Part of what’s satisfying about these sorts of collections is there is a finish line in sight. You can see clearly what you need to complete a collection. There’s something almost magical about seeing a complete collection of anything, displayed however is appropriate. It’s often something to be proud of. Now, this is where I come to video game collecting (sorry it took so long). Collecting video games (for me at least) isn’t just a case of collecting every game in a series or every title for a certain platform. Sure there are completests out there who will collect every single title released for a certain platform, and in all honesty, these collections look phenomenal when seen in full. But there are also other collectors out there, more general collectors. People who just want “stuff”. “Stuff” relating to whatever console, series or character it is that that they decided to collect for. When I started collecting games I didn’t realise I was doing it. It was a happy accident. I have had various consoles over the years growing up and always enjoyed picking up games for them. Most birthdays or Christmas a new game would be on my want list, and I would regularly swap and borrow games with friends. I was always pretty active playing and discussing them with my friends; it was something pretty much all my friends were interested in to an extent growing up. It wasn’t until I started buying games and systems I used to have or ones I wanted back in the day, and was spending quite a lot of time reading and researching these treasures that I realised I had accidently started another collection. I started by buying the systems I used to have. A SEGA Mega Drive was first on the list, along with a bunch of games I used to have. Then games I wanted when I was younger but never got. Then games I hadn’t heard of. Then systems I never had or had even heard of, and so on. As time went on, the collection spiralled. I started buying more and more games and systems that were just for show, stuff I would buy in because they were “retro” then do nothing with. Dust collectors. So I started to tone it down. 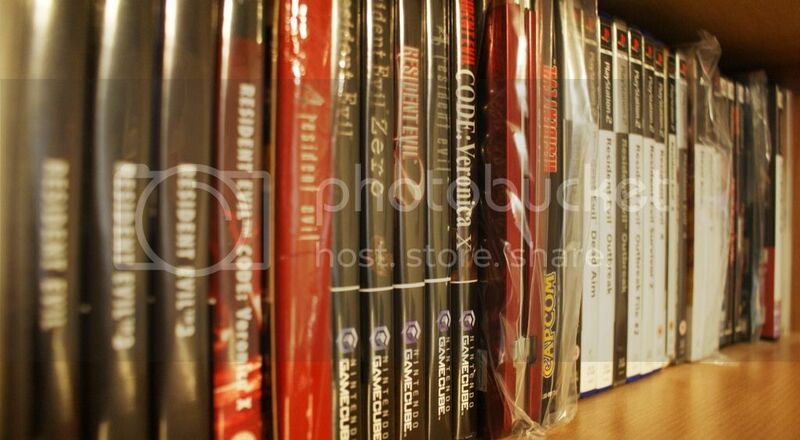 I had always enjoyed the Resident Evil games and already naturally already had quite a few in my collection. I decided that I wanted to refine my collection and limited myself to a couple of franchises that I wanted to collect for. Resident Evil, Metal Gear Solid and Final Fantasy VII. Had I thought about it I probably would have realised these were three of the biggest franchises out there and collecting for them would be an endless task. Alas I didn’t, I was naïve and I was a fool! After a few enjoyable years I decided it was getting too much again. I needed to narrow down my collecting further. I just didn’t have the time, space or funds to keep collecting to the level I wanted for all of these series. At this point my collection wasn’t on shelves but in boxes under the bed, on top of the wardrobe, in the loft. I had no room. I was still buying but then almost immediately hiding the goods. I had to refine it further. 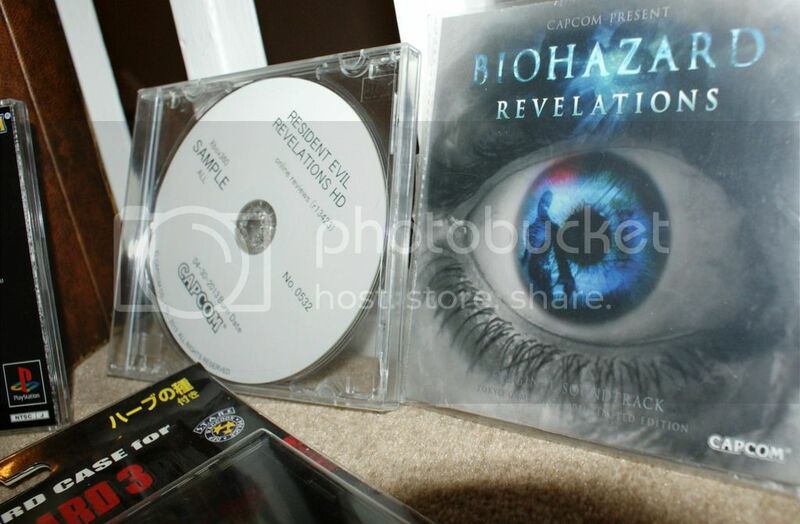 It was a tough choice as I was a huge fan of all of the series I mentioned, I had (and still have) fantastic memories and emotional attachments, but for whatever reason I decided that from now on, my main focus was going to be to collect for Resident Evil. In all honesty I’m really not sure how long it has been that I have really been collecting solely for RE but it’s safe to say it’s been quite a few years. At first I was overwhelmed by how much stuff there was out there to collect and that still happens to me today. I like to think I have a fairly large collection of items but my humble shelves of zombie goodies are pretty slim compared to some of the mega collectors out there. But that’s not a bad thing at all. 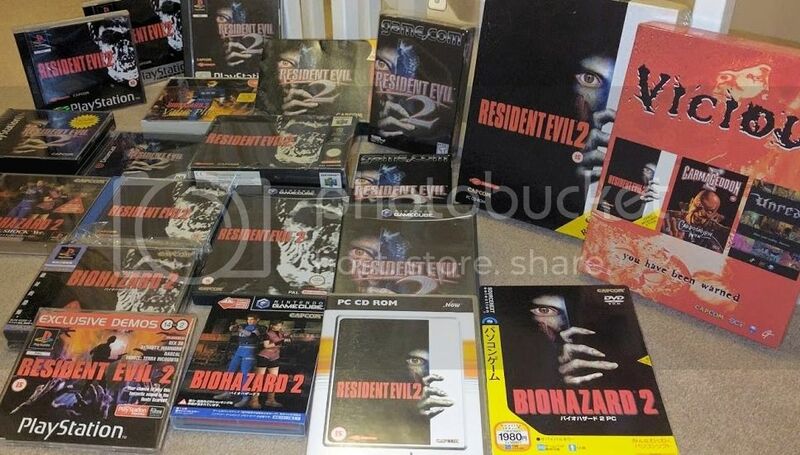 Because RE is such a huge franchise there is a massive amount of collectables out there for it, so much so I would argue it’s impossible for anyone to have a full RE collection. That’s part of the beauty of it, everyone’s collections are different. I’ve spent many hours drooling over other’s collections online, looking at items I know I will never acquire in my collection but admiring them none the less. I’ll sometimes look at my collection and see items in it I haven’t seen very often in others collections or items that are often overlooked and that’s what it’s all about. Collecting for RE is a challenge, there’s no doubt about that. There is such a mix of merchandise out there that my advice is to have an idea of what you want to collect at the start and adapt as you go along. Try to narrow it down to what you want at least a little in the start. I started by buying the UK PAL games in the series. I got the PS1/2 games on the original black label releases first of all, then moved onto getting the platinum version. Then I happened to buy a couple of the import NTSC games in a bundle and that’s when the collecting really spiralled for me. I decided I wanted to collect every variant I could get my hands on. Black labels, Platinums, re-releases, box sets, imports, budget releases. Whatever it was I wanted to try and get hold of them. I’ve slowed down on this now a bit but have quite a large amount of variants on the shelves so far. If you haven’t tried collecting like this for the series I think you would be surprised at how many releases there actually are for some of these games, some of them spanning over 20+ variants out there. Along with collecting variants I also like to try and collect the things I often don’t see in others collections. I like to collect the demos and trailers that often came with various magazines. The reason I like to do this is they are one of the few items I can still occasionally find in “the wild” at markets and car boots at a reasonable price. Often these items aren’t worth anything really, but because of that it makes them hard to find online as often people don’t bother trying to sell them. It’s a bit of an odd reason I know but at a stage where I’m faced with excessive import charges, midnight bidding wars and eye watering prices, it’s nice to still be able to pick up something cheap for the collection I don’t have. Generally I have a few “rules” for my collecting such as only buying complete items, good or better condition, only official items etc. From time to time I do break these rules but generally I stick to them. Almost all my collection is official, but if I find something unofficial that’s of interest I’ll pick that up if I can. 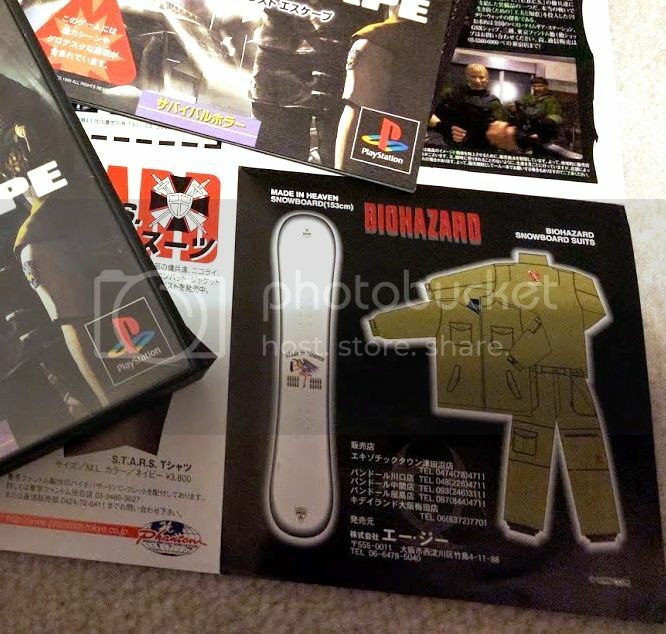 The Biohazard demake for the Nintendo Famicom is one of these exceptions. One of the things you will find looking online for RE items is that there is so much out there. Items range from standard games, clothes, figures, lighters, watches, books, comics, movies, soundtracks, limited edition consoles to some of the more unusual collectables like bottles of aftershave, luggage/laptop bags, music boxes, airguns, food products even a snowboard! It’s safe to say there’s always something else out there to hunt and track down. That’s probably what I enjoy most about collecting for this series, there’s always something I’ve not seen before and there’s always something unusual out there to try and locate a titbit of information on. It’s that thrill of the chase that keeps my collecting going. To me it’s not about having the biggest or best displayed collection but about having a collection that I’m happy with and want to keep adding to. It’s about finding those items that interest me and hopefully others who see them. It isn’t a case of showboating, but sharing what you have collected with other likeminded people. There are RE collectors out there who have their own collections on forums, on their own websites and at least one who has even had his own book printed full of his insane collection! It can be quite easy to get intimidated by other collections out there. I won’t lie; there have been occasions when I have seen other collections online and almost thought to myself “what’s the point, I’ll never have a collection as good as that”. But that’s the wrong attitude. Collecting shouldn’t be about competing to see who has the most “stuff”, it’s a personal thing. It’s about trying to add items when and where you can that make you happy. It shouldn’t matter that they aren’t the rarest or most desirable items; it should be something that you’re proud to keep hold of and have in interest in. If you just keep buying items for the sake of it (as I used to do with my retro games), it loses something. I have had some months where I have bought loads of items for my collection, then I’ve had month after month pass by where I haven’t added anything at all, to me it’s not about. To anyone reading this who has felt like this at some point, with any type of collecting, I would just say do what makes you happy. If you’re aiming just to have the most “stuff” and get intimidated by other collections then maybe it’s not for you. If you’re collecting for the enjoyment of it and the interest, stick at it. Collecting should be personal and it shouldn’t matter what others have, so long as you’re happy with the items you have. Having more items doesn’t instantly make you a bigger or better fan. There really is more than enough out there for anyone to start collecting and within circles of collectors there’s various sub types of collectors out there. Some people try to collect everything whereas some may choose to buy only certain types of items. Figures, comics, games, prototype/beta, promotional items the list goes on. It never ceases to amaze me at the variety of collectables out there; it’s safe to say there is something out there for anyone if they dare to take the plunge! I absolutely love collecting for RE, but it is definitely a love hate relationship. I really do think that as a collector I have enjoyed collecting for a specific series, much more than I did when I just collected for everything, but at the same time I still have to decide what to and what not to collect relating to RE. For my own collection I have a few things that I don’t tend to collect. Often not because I don’t want them, but more often that it opens up another rabbit hole to get lost in. I have a handful of figures, but not many. I really like them, but I have enough on my plate collecting what I do already without beginning to try and track down all of them in the condition I want at a price I can afford. I don’t really collect sealed games either. I have one or two but just ones I have happened to find cheap or came with other items. I much prefer to have something I can play, look through the discs contents and flick through the manual, than have an item never to be opened. Then there are the Anderson movies. They aren’t for me at all. I don’t want to have anything at all in my collection to do with them; I’d rather pretend they didn’t happen. It’s worth noting that for some collectors out there, it can happen that you can get more fixated on the actual collecting than the games or series themselves. I have a few friends who collect for certain systems, going for full sets. They can tell me what a game sells for, what the cover art looks like, regional differences etc. But if I ask them what the games about or how it plays, there’s a strong chance they won’t know. To them they are pretty much just trophies. That’s one of the reasons why personally when I look at collections online I don’t see the owner as someone who’s a “bigger fan” of that system/series etc. than me, but someone who collects for a different reason. I have some items in my collection that I really am happy to have, some of my showpieces of my collection. I have some original comic pencils from the last Wildstorm comic runs, the Resident Evil Origins Press Kit, a SEGA Saturn Promo, a Revelations Review build and others goodies. I don’t list these items above to try and show off, but to raise the point that they are items that interest me, and I’m proud to have them on my shelves. 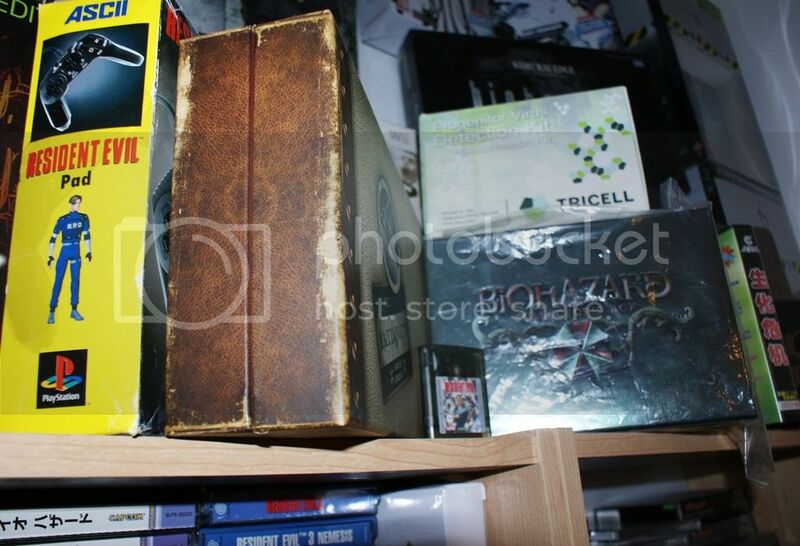 The items listed above would not interest every collector, the same way I may not have the interest for other collectors’ items (Such as sealed games mentioned above). For each of these collectables I don’t just have the item; but the memories of getting them. That’s something else I’m attached to with my collection. Lots of the items I have were just your standard eBay purchases. But some of these items have a history. Some of them I really had to work hard to get hold off. Some of them almost have their own stories to go along with them and that’s what I really love about my collection. 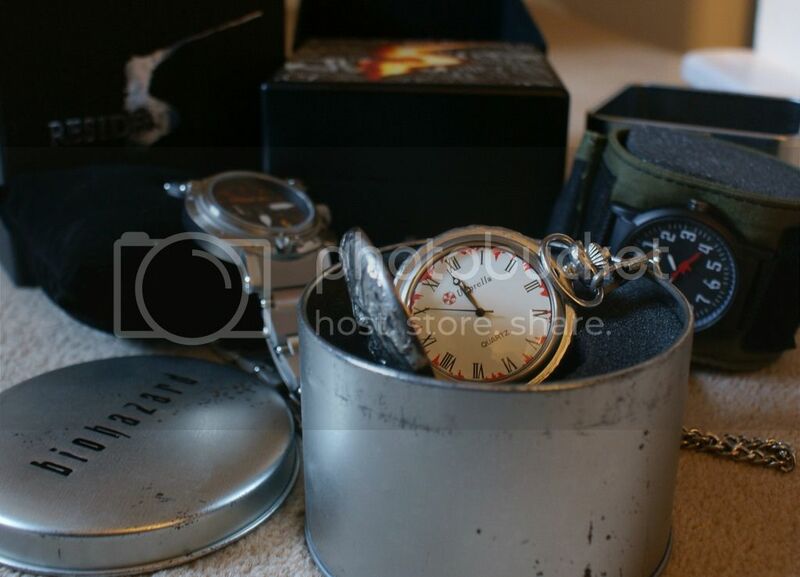 I can recall how or where I got some of these items, what I had to trade or who I had to negotiate with. Whether it was a bargain or if I got caught up in the moment and paid too much. Was it a struggle getting it here in one piece or did I manage to find it out in the wild someplace I would never expect. One thing I know for sure about my collection, it isn’t the biggest and it isn’t the most extravagant out there, but I don’t just have “things” sat on my shelves, I have the stories and I have the memories.